The stats helper monkeys at WordPress.com said I had about 2,600 visitors in 2010 or as the monkeys put it about 6 full 747s of people. I’ve only been blogging for about seven months, so I’ll take that as a positive. Yesterday I took care of all but one work-in-progress aka WIP I had suffocating in plastic zipper bags. I took the needles out and either ripped them apart or will rip them apart. The yarn will be repurposed. The one WIP is one mitten still needing a thumb and partner. 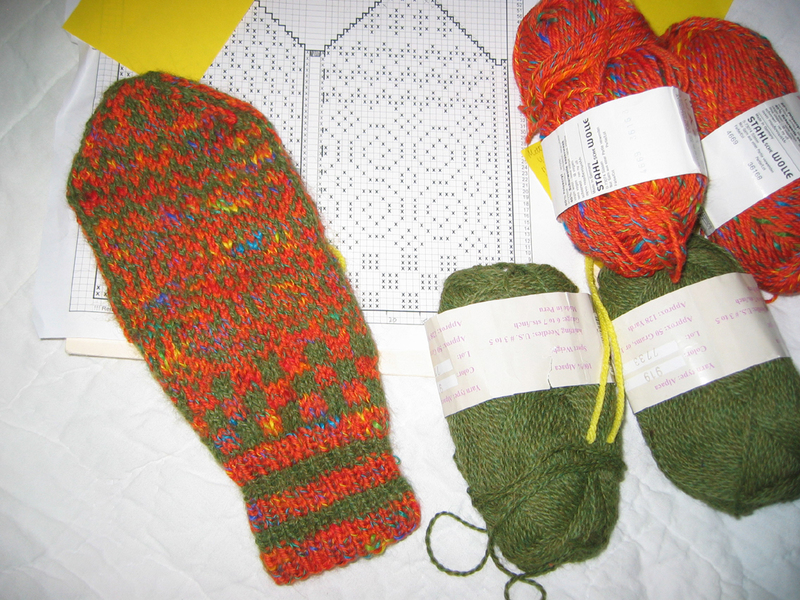 I started these mittens in 2009 for a friend. Fortunately she didn’t know about the surprise since I never finished them. Th yarn was on sale, naturally, but the orange had too much of the green in it to contrast the pattern I made up. This entry was posted in knitting and tagged knitting, WIP by Patti_is_knittinginflashes. Bookmark the permalink. I think you should make a hat instead! With pom poms on top! That would be very cute on a little kid…..whip it up!